Congratulation to Oscar Marín who has been awarded a ERC Advanced Grant by the European Research Council in the 2017 call. This is the second ERC Advanced Grant obtained by Oscar. ERC Advanced Grants are designed to support excellent Principal Investigators at the career stage at which they are already established research leaders with a recognised track record of research achievements. The Centre for Developmental Neurobiology has now a total of three ERC Awardees. The 2.5M€ grant will support research that aims to understand how developmental mechanisms ‘sculpting’ the distribution of inhibitory neurons across different neocortical areas contribute to their functional specialisation. Oscar Marín said: "I am very happy that we managed to secure funding to support this project for the next five years. 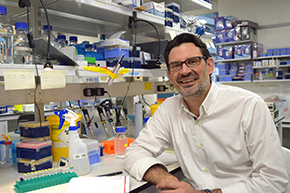 The ERC grant will allow us to explore the relationship between developmental mechanisms and the emergence of function in the cerebral cortex – I am thrilled that we can start soon." The mammalian neocortex consists of discrete, but highly interconnected, functional areas that collectively encode features of the environment, form associations between stimuli and drive behaviour by transforming sensory input into motor output. All neocortical areas are organised into six layers containing two major classes of neurons, excitatory glutamatergic pyramidal cells and inhibitory GABAergic interneurons. However, each area has distinctive cytoarchitectonical features and inputs that largely determine its computational capabilities. While the contribution of pyramidal neurons has been widely studied, interneurons have received little attention in the context of the functional specialisation of cortical areas, even though their distribution is highly heterogeneous. The central tenet of this research proposal is that distinct patterns of inhibitory connectivity may accompany, and perhaps even determine, the functional specialisation of neocortical areas. This project has the potential to transform our understanding of the organisation of inhibitory circuits in the mammalian neocortex.